Want a free VMware Fusion 6 Professional License? You are here: Home / Fusion / Want a free VMware Fusion 6 Professional License? Here is an exclusive for my Twitter followers! Last week I had the chance to catch up with Simon Bennett, Product Manager for both VMware Fusion & VMware Workstation and just chat about some random topics. 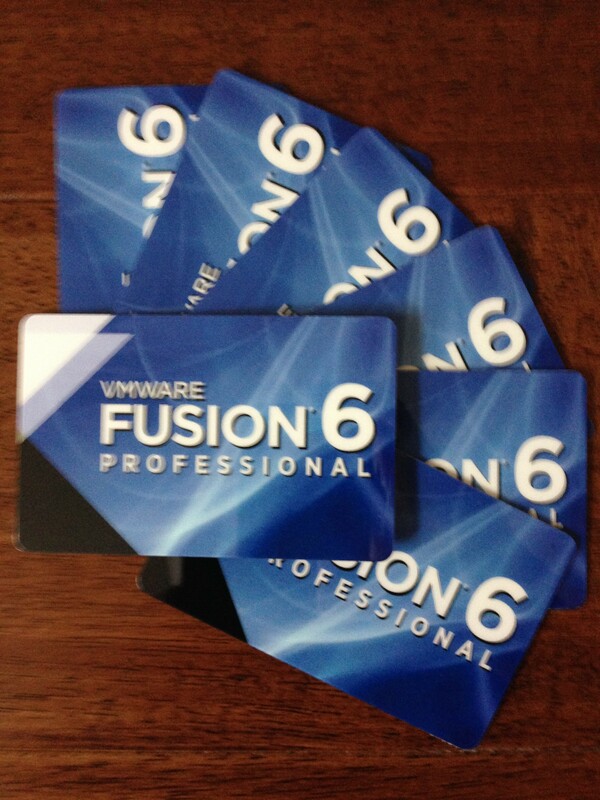 Simon was kind enough to offer me seven free VMware Fusion 6 Professional license keys, each valued at $129 USD. I personally already had a copy of VMware Fusion which I use all the time on my iMac whenever I need to quickly spin up Virtual Machines. I thought I would extend this generous gift from Simon onto my Twitter followers, since several of you mentioned you would like one after I tweeted about the gift. I had thought about giving it to the first seven followers that responded and realized that would have been unfair to folks who were not watching their Twitter stream at that very moment (which nobody does, least I do not). So, if you want a super easy way to win a free VMware Fusion 6 Professional license key, take a look below an please CAREFULLY READ all directions. Leave a short comment on this post on what this VMware Fusion license key would enable you to do, whether that is solving a particular problem or challenge.In addition, what is the one feature that you are most excited about for new users or what new feature would you like to see for existing VMware Fusion customers. Simple, right? I will randomly select seven winners from the list of comments in one weeks time, so make sure you leave your Twitter handle in the post else you will not be eligible to win. This is open to everyone, you do not need to reside in the US to win. How to run Nested ESXi on top of a VSAN datastore? VMware Fusion Tech Preview 2 can now connect to ESXi & vCenter Server! for me VMware Fusion Professional help using programs that run only on windows for vsphere clinet and some vpn’s. Great product. . My Twitter handle @wozik. Finally a serious chance to migrate half my clients to the Mac once XP support ends next month!! Fusion 6 Pro would allow me to take a mobile lab with me on the road when I travel. I don’t sleep well in hotels anyway, so I could get more lab time in. Beaming my Windows VM’s to the hotel TV would be great. My 13″ Retina MBP is built for portability, not screen size. @gallifreyan here. I have a time-limited Fusion license and an old version; I’d love to upgrade permanently for my semi-antique 1920×1200 Macbook Pro to encapsulate my work interactions separate from my home stuff. 🙂 Thanks! I would put it on my old xserve1,1 (2006) with OS X Lion. It’s a shame with the 32 bit EFI limitation on Xserve1,1, so this would allow me to get new use of the old machine. I had no luck with installing VMware ESXi or Linux on it duo to the 32 bit EFI. With VMware Fusion Pro I can get rid of my old Win 7 PC and can use Zoom’s “H.323/SIP room connectors” on customer visits. Zoom is my favorite videoconference solution (www.zoom.us). It would allow me to keep my ESX skills sharp – get a VDI lab running with Win8, Get Hands on With Hyper-Vand start my RHEV, and OpenStack. All on one MACBOOK. I also thing the updated learning center will be a great tool . This VMware Fusion license key would enable me to build a small lab on my MBP so I can test out configurations and new software while I am away from work. The one feature that I are most excited about is Unity mode. I can have a VM running with an old version of IE running for work apps that only support that old version of IE. @lamw, I’m trying to setup a lab to prepare for VCP before my voucher expires at the end of April, at the same time testing some DevOps tools on my mac mini. This will be of tremendous help to @kdapaah !! Working on alternative cost free to use vagrant with fusion. Improve my skill on VMware product. Doing some test and research with mininet and openflow. I hope to win this contest as Fusion will be perfect for my home lab. A Fusion license would finally let me remove crappt virtualbox that I’ve got installed on my mac right now. I’ve been a customer earlier around the fusion 3 days, but didn’t upgrade and would love to try out the new version. I used Fusion trail license to convince my boss to give me MacBook Pro with SSD drives. It helps me to work on Windows and Mac seamlessly. I would like to see that advance networking support are added to Fusion. I would like Fusion Pro 6 so that I can use linked clones, and the network editor. I would use Fusion Pro 6 to teach my son (and daughters) about virtualization. I could finally convince my boss to BYOM (Bring Your Own Mac). He could finally see how real professionals go to work. My Twitter is @discofris. And then I would check how many gb all non media files would take so that we could create internet backup. I’d turn a MacMini into a iSCSI SAN server by running AWS Storage Gateway in VMWare Fusion 6 Pro just for the fun of mixing technologies. Just a week ago my 15 year old son asked me how he could learn more about coding and hacking his system and he also wanted to use other OS’s for testing the games he is developing. I talked to him about using a virtual machine to avoid ruining his own PC. I just started using a Mac recently when I switched to a new position in a new company. They didn’t provide me anything to be able to run a Windows VM on it (unless I wanted to use VirtualBox…..ewww). Plus, I have Workstation 10 at home and I could use the both for my nested virtualization lab for VCAP5-DCA exam prep. VMWare 6 professional would help me to develop documentation for intricate system configurations. I can snapshot a fresh Linux install, and walk through the configuration steps. If I find a problem or screw up part way through, no sweat – I make adjustments to the document, revert back to the snapshot and start again! I would love the be able to run Mavericks inside a VM. It would allow me to test my DJ software as well as develop and test apps for Mavericks in a clean environment. I’d also test new versions of ESXi for my day job with nested virtualization on my Mac. One feature I would like to see added is the ability to add hard disks through the GUI to VMs that are linked clones of other VMs. I believe this feature is currently unavailable. Thanks for the opportunity to win a copy of Fusion 6 professional. @yasinsky here. Now I have Fusion on my iMac and running 1 vm I can switch to different OS and test my web projects in different conditions, controlling the quality. Pro license would definitely contribute to the process at its best! I need to test whether the features of vmware player vmware fusion I have them in, if you do try to do snapshots as well as going the performance of virtual machines that I created. I’d use this version to help port the vbrownbag couch to openstack modules over to the VMware fusion provider. I’d like to see more of the community have the ability to play with these platforms and vmware. Id like to see more network control in future releases of fusion (ability to control dhcp and more). Finally an opportunity to run Windows on my MacBook and start studying PowerCLI and join the smart kids. Also getting Outlook on Windows will solve the issues I have with Outlook on Mac, like accessing shared calendars. With Fusion I can take my portable lab with me every time I’m traveling. The advanced networking is one of the feature that I use the most of the time. Lot’s of great comments above! Got extra inspiration just by scrolling down to leave the comment:) I would use it for controll of the vsphere lab at school. I would also like to see whats new and enhanced about the unity feature as well as the improved 3d (graphic accelerator) support. Running Virtual Machine with Fusion 6 can run Near-Native performance in OS X Mavericks. With Fusions6, I can save my Mac’s battery life longer & experiencing the powerful 3D graphics as well as support for OpenGL 2.1. Fusion will allow me to have a mobile auto lab. No more using teamviewer to my home lab! VCP5-DT watch out! I’m aiming for VCDX by end of year. While I use VMware Workstation on work laptop which I use as mobile homelab when working away to study for my VCAP-DCA and blog my notes as a breakdown http://darrylcauldwell.com/vcap5-dca.html and plan to do same for DCD. But at home we’re 100% OSX cap to expand homelab I currently use ESX embedded USB to boot Mac mini, but with Fusion 6 license I could more easily use the Apple hardware at home and be more productive in my study. My favourite feature is nesting test ESXi. Feature I’d most like added in next release is the ability to run nested HyperV 2012 VMs without having to tweak the vmx file.